Wow, time sure flies and here we are again with Thanksgiving just around the corner. For the first time ever we will have our grands for turkey day and then will drive them back to DC to spend a week with them. Normally we have a trip west to Idaho planned for Christmas, but as my daughter has relocated to the DC area we are rather enjoying the thought of being home for some of the holidays. I don't have much cooking to do for thanksgiving, I'm only responsible for the cranberries and oyster dressing as we have a large gathering at my neighbor's house with everyone bringing a dish the cooking load is lightened considerably for the host and there is always too much food. I haven't planned too far ahead for Christmas Eve. but it will be our Italian traditional seafood dinner and I plan the menu around the number of guests, lots of company cioppino or just a few of us start with linguine and clams and move on to fish and a few seafood appetizers. We used to go nuts with 7 or so seafood dishes (feast of the 7 fishes), but that is when you have tons of help from ambitious cooks, these days 3-4-5 fishy items seems to work just fine. I know a lot of you make all kinds of sweet goodies for the holidays what are some of the favorites on the list this year? What are your plans and favorite dishes for the upcoming holidays? I'm eyeballing the FC Irish whiskey cake for one thing. Yeah, I can't believe it's almost Thanksgiving! 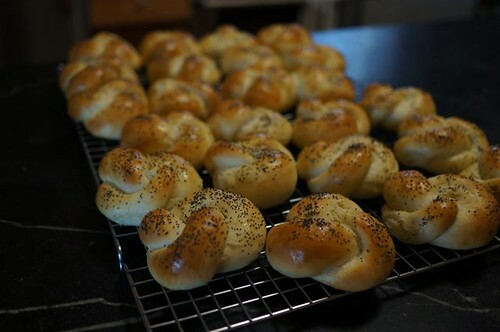 We are going to the in-laws for T'giving and I always bring bread, so I am making Peter Reinhart's knotted dinner rolls. I got a bag of cranberries at Costco, so I'm thinking of making the cranberry sauce with maple and orange from Ellie Krieger from Issue 119-- that was good stuff and I love whole-berry sauce, not just the canned stuff. We are traveling for Christmas, looking forward to a traditional Polish Christmas eve with my relatives-- Wiglia, or The Vigil, is a meatless feast featuring (in my family) pierogies with cabbage or cheese, and barszcz, a mushroom soup thickened with fermented oatmeal-- not for little kids, definitely! Your seafood festival sounds wonderful! I also need to whip up some cookies or caramels-- the in-laws are exchanging food gifts again. The Smitten Kitchen cookbook has some wonderful-sounding cider caramels. Might be too good for the in-laws, haha. Can't wait to see what you are up to and am definitely looking forward to kg's cookie extravaganza! Yep, I am doing my cookie extravaganza once again. I am hoping to sit down Wednesday night and outline what I will be baking this year. I usually ask for all my orders to be in by the end of November so I better get my act together! I started my holiday baking today with a double batch of dough for Grandma's oatmeal chocolate chip cookies-- there was so much dough it almost came flying out of my mixer and I have the 6qt bowl! Here is the recipe from Grandma's "secret" files, i.e. 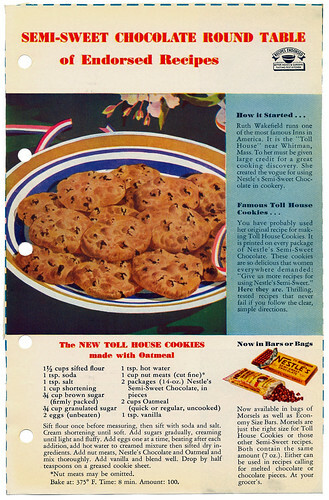 the Better Homes and Gardens Cookbook from 1940. Hope you all are baking too! Look at you go! I am getting started on Friday. I didn't have nearly as many orders this year but I still did get enough to make my marathon baking days happen plus my usual baking for giving away. I will post photos. Friday sounds like holiday baking party day! The author was a frequent poster on the old board, under the name CookiMonster. Anyway, these caramels are great. I mentioned to my aunt-in-law that I might not have time to make them this year and she sounded kind of miffed. Since this is the aunt who provides free babysitting and rides to the airport, I quickly reconsidered. This morning, I scored a quart of cream that is 3 days from its expiration date in the sale section at my local grocery store-- the recipe calls for 1 2/3c, so I should be able to whip out 2 batches if I hurry! Happy Thanksgiving everyone! Here is my T'giving contribution-- luckily my hostess-with-the-mostess cousin-in-law provided everything else! We reheated these a little too long, so they were just a smidge dry-- but excellent with a little butter (or in the case of the 2-year-old twins, excellent as a vehicle for eating a ton of butter!). The recipe calls for 2.25-ounce rolls, but I split the dough into 1.75 ounce portions and this made an even dozen rolls. Yum! They look pretty good to me. What recipe did you make? Good luck with the pie and cookies! Hi MarrieAnn, thanks for the kind words and Hello world yourself! My in-laws are lovely people, but for some reason they don't do pie very well-- this Thanksgiving, we had pies that were purchased from Baker's Square-- just awful. So, this weekend I busted out the leaf lard, the Spice House Apple Pie Spice mix, and the butter to bake a make-up apple pie. 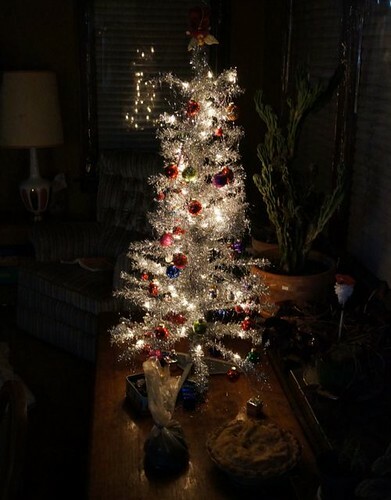 Here it is, at bottom right, under our crazy little tinsel-tree. Ho ho ho! Next I have to start thinking about Xmas cookies! I'm not great at pies, but I have a friend that is exceptional at baking them so I count on her. Might have to try a mince pie though. I'll take a picture of my predictable disaster, LOL. 13.5 hrs of baking over 3 days. If I had done a bit better planning I could've finished in 2 but a couple of things got in the way. Will never, ever make vanilla and chocolate stripped or checkerboard cookies ever again in my life, mark my words :P I did the FC checkerboard ones a couple of years back and nearly just threw the whole thing in the garbage, this time I figured the striped ones would be easier, well...a little bit but still not a favourite. The cherry chocolate rounds I made as DH asked for them. I don't like cherries other than fresh so I wouldn't have chosen these. He is very happy with the end result. I also made the chocolate thumbprints again this year from the FC cookies book. They turned out beautifully as usual. Oh, and the cinnamon sugar palmiers were absolutely delicious. How is your baking coming along? No, I don't make candies. Tried to make fudge one year and it was a disaster!!! Are they melt in your mouth?? Wow, you've done amazing work! They look great, are you going to eat them all? I can't stand when there are such a beautiful cookies around me. Sure I will eat them all, that's why I prefer not to bake such a temptations. As usual, your cookies are beautiful! The striped cookies look great, although I can appreciate that they are a pain to make. I have made the spiral ones and they are a big hit, especially with kids. The slice-and-bake aspect is good-- easy to have a roll or two in the freezer. The chocolate-cherry ones do sound delicious-- I agree with your husband! Mmm, I bet the palmiers and thumbprints are wonderful too. 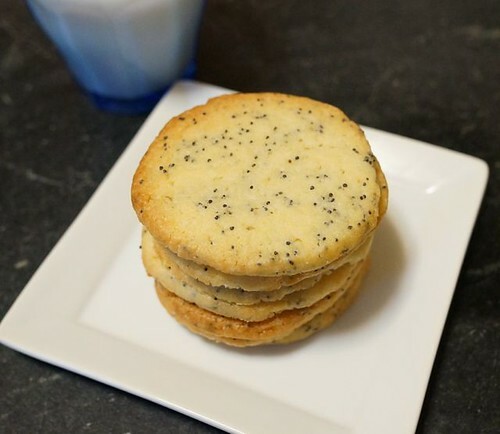 The lemon-poppy seed cookies came out great-- I love slice-and-bake. Lemon-poppy seed is a traditional Polish combination-- at least as far as I know! The caramels are a bit of a production-- you have to monitor the temperature really carefully, but they are unusual and do keep well. Also, one batch makes a LOT. I have an aunt-in-law who makes great cookies, but nobody makes candy, so this is my Xmas niche. I've never tried to make fudge, but from what I hear, it's harder to make than caramels-- the directions with the recipe are very good. Happy cookie eating and delivery! 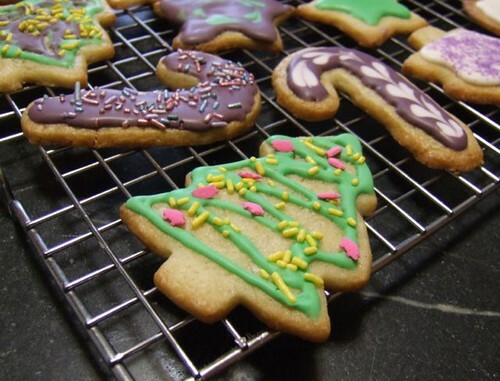 Today must be Cookie Day-- a joint American-Canadian holiday! Thanks for posting all those photos! Well, every year I learn new things about cookies and which would work well and which definitely won't but sometimes the recipes fool you! HA! Did I mention that DH was the one to shape all 150 thumbprint cookies? He did a good job ! I just didn't take a pic as I have one from last year. Yes, I agree about decorating-- if I didn't have a kid, I wouldn't bother with all that, but the kid does love the frosting and sprinkles! For the caramels, you are correct that you pour it in a slab (8x8 inch pan) and then cut it up. It's certainly a lot less painful than shaping thumbprint cookies! My helper is good with laying out the caramel wrappers, but gets distracted easily. 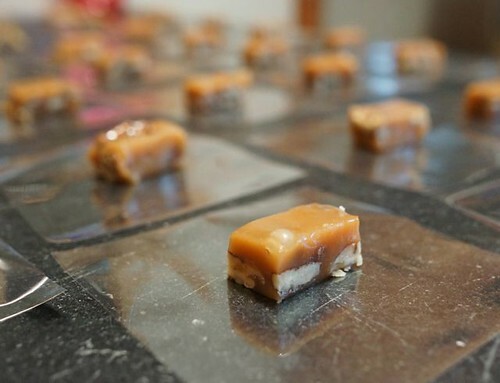 Once your husband tries the caramels, he might be more than willing to help wrap them. That reminds me, after my helper gets done with her reading homework, I have a pan of Sea salt caramels that need to get wrapped for Saturday! I have to make a cake for a birthday party next week and I am tempted to make the one from the cover...a bit worried though that it wouldn't turn out. But at the same time I know I won't choose a tried and true recipe, that is just not in my nature :P Don't worry, I'll post pictures of whatever I make. Oooh, I can't wait to see what cake you pick. The only reason I would worry about the cover cake is if there are kids present-- I don't think it's at all kid-friendly. Ha, sounds like you are off the hook for caramels.... I just wrapped my next batch today and my little helper was nowhere to be seen-- little stinker had her nose buried in a book. I usually make cupcakes for my daughter's birthday, which is right after Christmas, but we have the party in January. Anyway, I might make the cover photo cake for the party too-- the kids can have cupcakes and the adults can have the cake with whiskey and coffee! She was really happy about the cake though and I think it turned out really well. As usual, with sweet recipes I always cut the sugar and find that things are still sweet enough so with both the cake and the icing recipe I cut the sugar and when I tasted the batter and icing I loved the balance of the chocolate and the coconut. I hope ICD posts a picture of her cake!! That cake looks beautiful, great work! Also, Merry Christmas to you and yours-- enjoy your non-overcooked vegetables and all the other trappings of the season! "As it turns out she didn't serve it at the party because she wanted to save it and have it just with her family so I didn't get to taste it :("
That's so not right! I hope this person has other redeeming qualities! to be fair she invited me to go back the next day to have a piece. When I arrived she had not yet cut it as she was waiting for me, unfortunately I couldn't stay long so I just collected my cake dish and left. Survived marathon day number 1 and gearing up for marathon day #2. X-mas eve DH and I celebrate alone at home. He has had a wicked cold with nausea so I decided to keep it simple and just made us the pasta with fresh breadcrumbs for dinner. His response "meh", LOL. I quite liked it but I added tomatoes to mine and I added a bit of lemon zest at the end to perk it up. I don't think I added enough pasta water as it was a bit dry. I have never used anchovies and keep avoiding buying them so I don't know if this would've added to the dish. I am tempted to buy them in a paste (I think I've seen them like this at the store) to add to dishes a bit at a time. Is it an acquired taste? Yesterday we celebrated with my inlaws and my mother in law's side of the family. I made the carrot and the fennel gratins and the salad from the current issue. The salad called for blue cheese but since I don't like blue cheese I used old cheddar instead. Everything went over very well. I was very surprised because they are very traditional in their cooking and every time I push the envelope a bit (yes sadly this is pushing the envelope) they don't always go for it. Most of the food was gone and people asked what was in the dishes. The salad looked so pretty. Today we have x-mas with my inlaws again and my father in law's side of the family. So off I go. I have to make an appetizer. So I am making this. Except for to save time I roasted the vegetables all together rather than sauteeing them one at a time. I have the veggies sitting on a strainer right now and have th puff pastry ready. I hope you are all having a wonderful time with your families. ...the way to the NYE dessert cake plate. I made the layers today and I wrapped them,froze them and can't wait for the darn thing to show up. I was considering a Champagne cupcake/Georgetown Cupcakes, but the cake won out easily. I am doing a very casual dinner NYE for just a few and we will have a hearty pasta fagioli, big antipasto, fresh bread and of course Cake! I'll find a simple plated appetizer (as I did for Christmas Eve) so much easier than plates of nibbles and stuff. I have been cooking, trust me, just too busy to take pictures. I will get the cake in photos to be sure. I can't wait for pics. Happy New Year everyone!! !